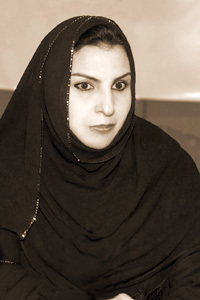 Saadia Mufarreh is a poet, critic, and writer who lives in Kuwait. A 1987 graduate of Kuwait University with a degree in Arabic language and education, she has published four collections of poetry: Mere: A Mirror Lying Back (1999), Book of Sins (1997), When You’re Absent , I Saddle My Suspicion’s Horses (1994), and He Was the Last of the Dreamers (1990). She is a regular contributor to several Arabic publications and serves as the art editor of the newspaper Al-Qabas in Kuwait.